I'm not yet saying this is going to be a banner season for Common Bagworms (Thyridopteryx ephemeraeformis). However, I'm commonly finding bagworms in southwest Ohio without much effort. I've not heard reports from elsewhere in the state. I reported that overwintered bagworm eggs began hatching in southwest Ohio around May 30 [see "Bagworm Alert!" posted on May 30, 2018]. Since that time, I'm finding that bagworms in my part of the state are widespread with some very heavy localized infestations. I'm seeing numbers that I haven't seen since before the Great Bagworm Crash a few years ago. The problem is the bags are still very small and difficult to spot. I came across a small grafted 'Globosa' blue spruce (Picea pungens) today with its foliage being riddled by hundreds of tiny bagworms. It was a commercial landscape and I alerted the office manager. I had to point out the mass of tiny, hungry bagworms because they told me they thought only the "big ones" caused damage. The source of the infestation was obvious with numerous bags from last season still dangling from the lower branches on the infested spruce as well is its companion across the sidewalk. In fact, the manager told me that both spruces had been heavily defoliated last season. However, the heavy defoliation that occurred last season on the companion spruce produced noticeable branch dieback. 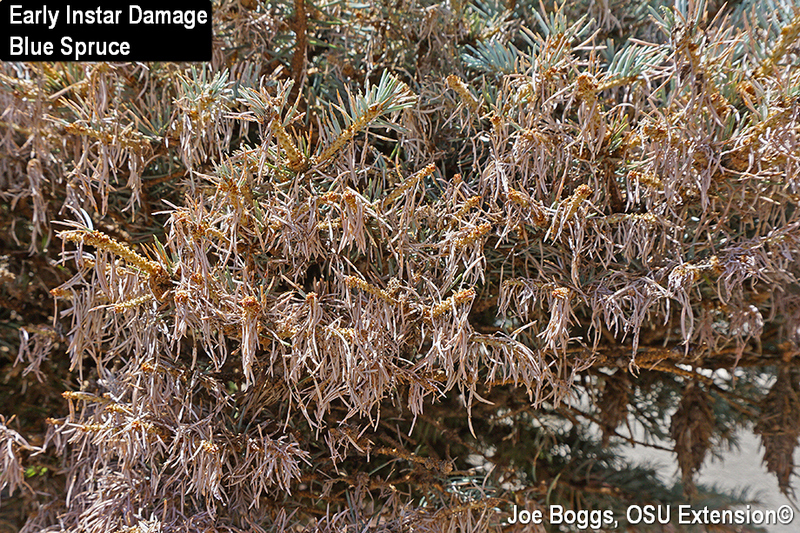 This showed the variability in recovery that we commonly see with bagworm defoliation on evergreen conifers; particularly spruce. Some trees fully recover even after heavy defoliation while other trees suffer branch dieback. Sometimes the entire tree is killed. Keep in mind that a percentage of newly hatched 1st instar caterpillars will produce a strand of silk to catch the wind and "balloon" to new locations. This behavior is one of the reasons bagworms often appear on hosts that were not infested last season. I also found bagworms feeding on a nearby serviceberry (Amelanchier sp. ); a reminder that bagworms will feed on over 130 species of trees and shrubs including many deciduous trees. I have found bagworms feeding on everything from oaks (Quercus spp. ), to American sycamore (Platanus occidentalis), to roses (Rosa spp.). I revisited a group of European hornbeams (Carpinus betulus) earlier this week that were heavily infested last season. Unless the trees are sprayed, they will experience a repeat bagworm performance this season; small bags were all over the trees. Don't let bagworms sneak-up on you and your customers! Look closely for the small early instar bags and don't forget to check deciduous trees as well as evergreen conifers. Please send me a message to let me know what you're seeing in your neck of the woods. Just click on my name at the top of this report to get my e-mail address.